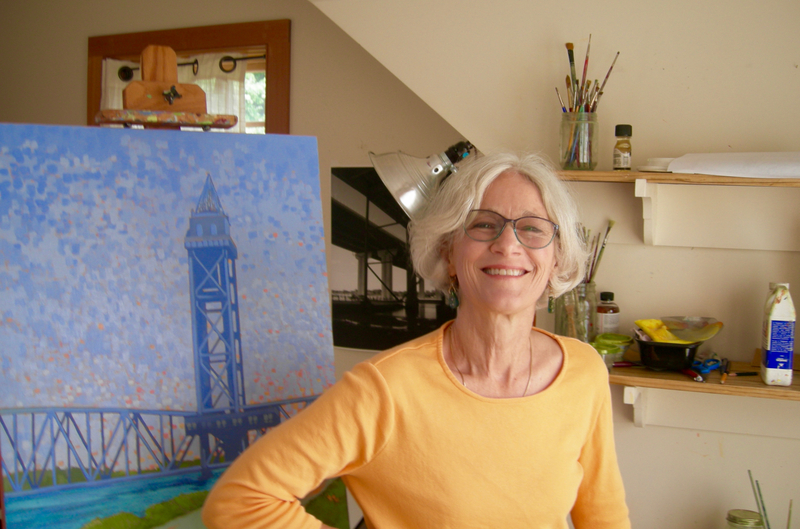 Using classically learned techniques, I begin with a sketch done on site or from photos I take on site, followed in the studio by careful transfer of the composition onto a toned canvas, a thin under-painting, and multiple layers to finish, creating loosely realistic images of meaningful places and familiar objects. Watercolor, pastel, ink and pencil are all favorite materials for my field studies and layouts. Digital photographs provide a great composition tool and reference bank. Bridges: Recently I have turned to themes of structure and perspective. The partial demolition of the old Sakonnet Bridge—a truss bridge built in 1956— and construction of a new bridge side by side revealed powerful shapes,contrast, pattern, and spatial depth that inspired many new paintings. My new work explores other bridges and their environment, using contemporary graphic elements with classic painting techniques to evoke the power of these connectors. Across Generations: In 2016 I completed a set of 14 of oil paintings derived from sketches drawn by my Great-Great Grandfather, the artist Julius Ludovici in the 1880s. His drawings depict features of the Rhode Island coast around Jamestown and Narragansett Bay; much the same scenery that captivated the Luminists. It was thrilling to try to recapture the light, vegetation, structures, and the open coastal views of the Nineteenth century from a twenty-first century vantage point.